I’m presenting a webcast on BizTalk Performance this Tuesday September 01, 2009 1:00 PM Pacific Time along with Trace Young who wrote the majority of the BizTalk Documentation. We’ll be covering a summary of all the performance tests we’ve performed in the lab this year and answering any questions. Please tune in if you have any performance related questions or if you just want to see what we have been up to. Just got a note from Ewan Fairweather from the BizTalk Customer Advisory Team. He is presenting a TechNet webcast on the BizTalk performance tests him and his team have performed this year and their results. Code Camp Auckland is coming fast – 13 of September 2009, the Sunday before Tech Ed. With many international and local speakers, this is the biggest Code Camp ever. I’ve added a new webcast on http://www.cloudcasts.net. This webcast shows how the WS-ReliableMessaging standard can be used in WCF to increase the reliability of message transmission across unreliable transports. The Fiddler tool will be used to examine how WCF creates a reliable session, and how messages and message acknowledgements are transmitted across the wire. The effects of blocking messages will be examined with reliable messaging turned off and on, and with the ordered delivery options enabled and disabled. I cam home a little later, and checked the news channels, there was no mention of this, did I get a scoop or something??? Well no, it is more perhaps an example of how poor the news service is in this country… shame shame…. A WCF question came up recently on StackOverflow about using a binding for a custom transport through configuration instead of code. My initial reply was that you needed all the right configuration classes associated with your binding so that you could register the right binding extensions for the usage. Today’s post discusses VS 2010’s enhanced multi-targeting support – which allows you to use and target multiple versions of .NET. We did significant architectural work in the VS 2010 release to enable a number of new multi-targeting features, and provide a much better experience. 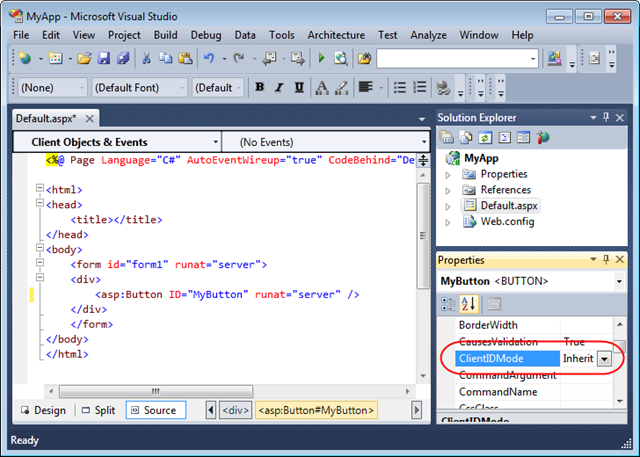 VS 2010 can be installed “side by side” with previous versions of Visual Studio. What this means is that you can install it on the same machine as VS 2008/VS 2005/VS 2003 – and use all of the versions at the same time if you’d like. 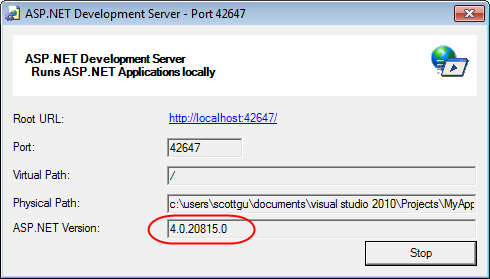 .NET 4.0 can also be installed “side by side” with previous versions of .NET on the same machine. .NET 4.0 has a new version number for both the framework libraries and CLR engine – which means it runs completely independently from .NET 2.0, 3.0 and 3.5. 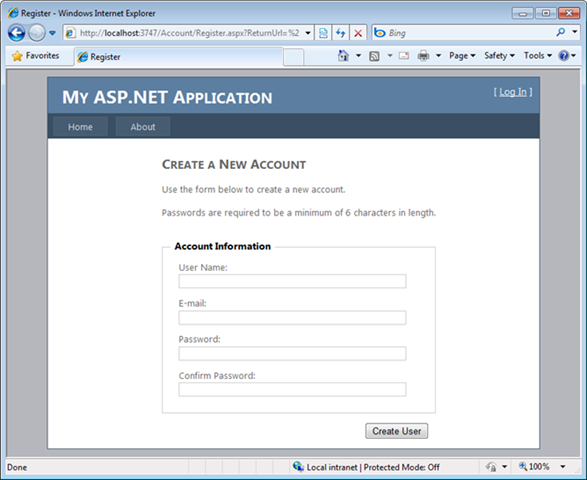 What this means is that you can install .NET 4.0 on a machine that has .NET 2.0/3.0/3.5 installed, and configure some applications to run using .NET 4.0 and others to run using the older .NET versions (the IIS admin tool allows you to configure this for ASP.NET applications). This allows you to use .NET 4.0 for new applications – without having to necessarily test and upgrade all your existing ones. VS 2008 was the first release of Visual Studio that included multi-targeting support for .NET. 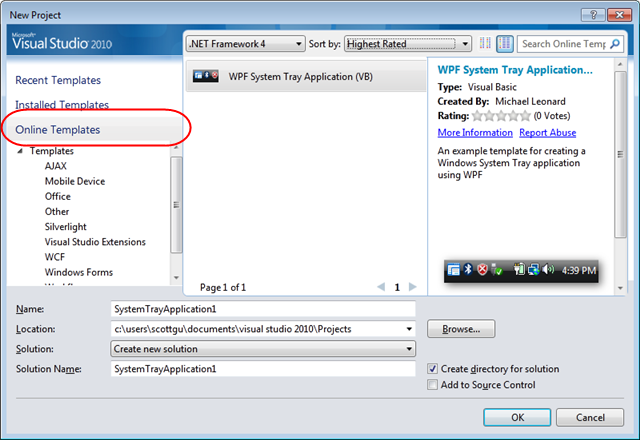 What this meant was that you could use VS 2008 to create and edit not only .NET 3.5 projects, but also .NET 3.0 and .NET 2.0 projects as well. This allowed developers to more quickly upgrade and take advantage of new Visual Studio tooling features – without having to necessarily require the newer version of .NET to be installed on the clients and production servers running their applications. VS 2008’s multi-targeting support was able to take advantage of the fact that .NET 2.0, .NET 3.0, and .NET 3.5 all ran on top of the same version of the CLR – and that the primary difference between the .NET versions was in their framework libraries. 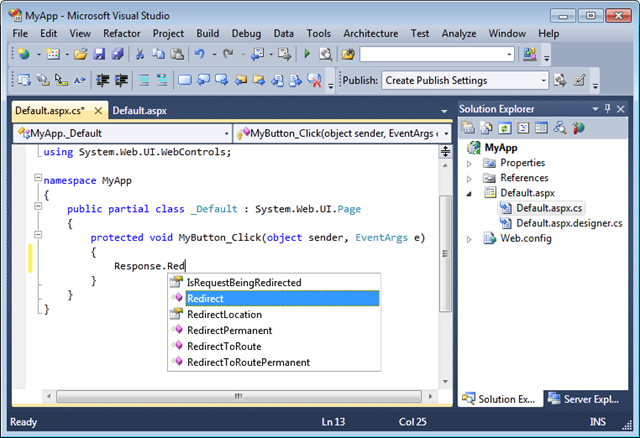 As a result, Visual Studio’s compilers were able to generate the same IL output, the debugger was able to debug against the same CLR engine, and the IDE support for multi-targeting was primary focused on filtering out new assemblies and project templates from showing up when they weren’t supported with a given .NET version. This multi-targeting experience worked – although it wasn’t perfect. Intellisense within VS 2008 always shows the types and members for the .NET 3.5 version of a framework library (even if you are targeting .NET 2.0). 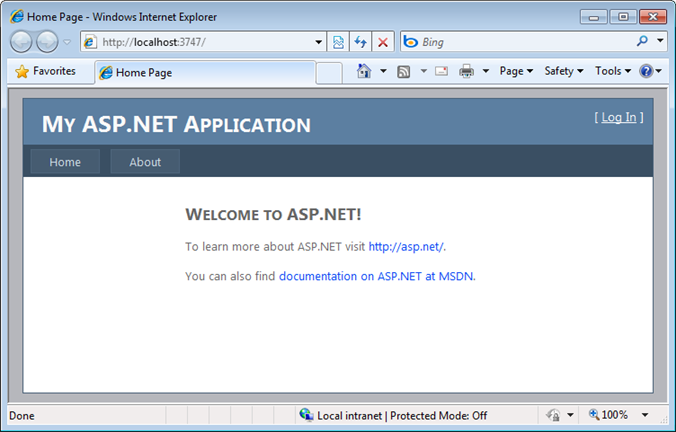 This means that you can sometimes inadvertently end up using a method that is only in ASP.NET 3.5 even when you are working on a ASP.NET 2.0 project. We made some pretty major architectural changes with VS 2010 to enable much better and more accurate multi-targeting support. VS 2010 now ships what we call “reference assemblies” for each version of .NET. A “reference assembly” contains only the metadata of a particular framework assembly – and not its actual implementation (making it much smaller in size on disk). This metadata is enough, though, to ensure that VS 2010 can always provide 100% accurate intellisense when targeting a particular version of the .NET framework. It also means that properties exposed through the property grid within designers, API listings within the Object Browser, and all the other various places within the IDE accurately reflect the exact API version signature. We also updated the VS 2010 debugger, profiler and compilers to be able to target multiple versions of the CLR. 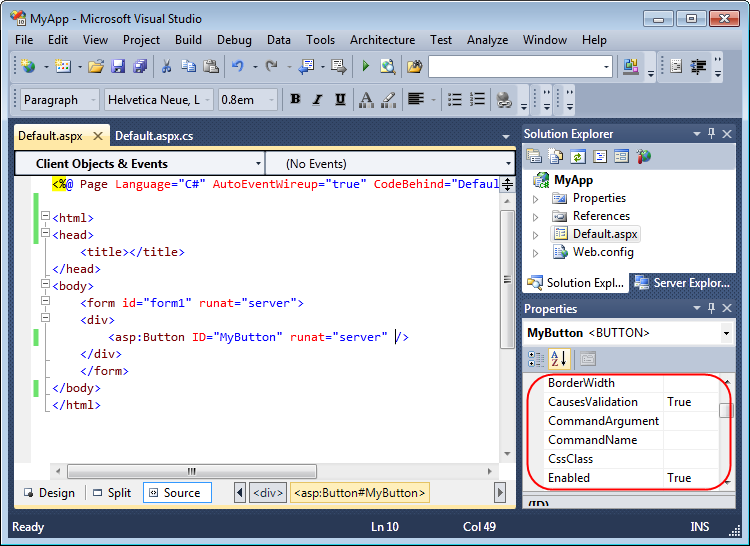 We can choose from a variety of different .NET versions above. Included in the list is the "Server Core” profile that supports the GUI-less version of Windows Server 2008 R2 – and which does not support certain APIs. Because the reference assemblies we use for metadata and intellisense can support any version or release, we’ll even be able to distribute versions of them with future service packs if they introduce any new APIs (enabling 100% accuracy). 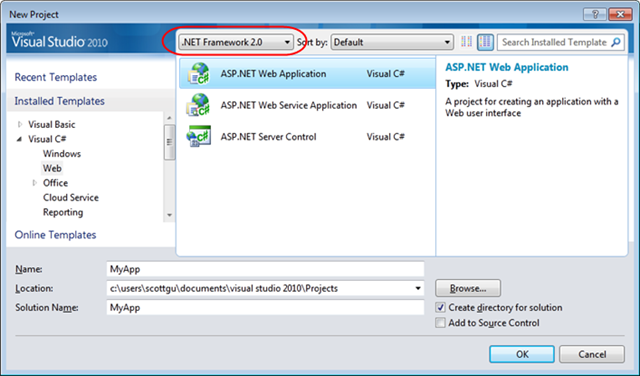 For this walkthrough, we’ll choose to move the project to use .NET 4.0. 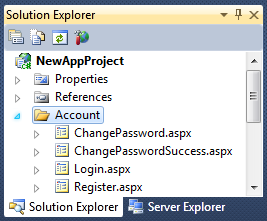 When we do this, VS 2010 will automatically update the project reference assemblies and the web.config file of our project to properly reflect the new version. The new Response.RedirectPermanent() method above makes it easy to issue “HTTP 301 Moved” responses – which can avoid your site accumulating stale links in search engines. The URL Routing engine is now supported by both ASP.NET Web Forms and ASP.NET MVC based applications, and the new Response.RedirectToRoute() method allows you to easily redirect to a route declared with it. 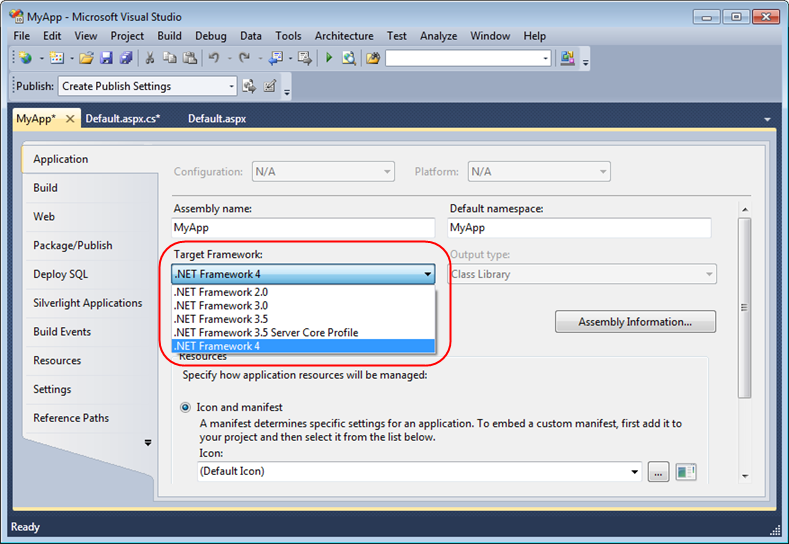 VS 2010’s multi-targeting support enables you to work on projects that target .NET 4.0, .NET 3.5, .NET 3.0 and .NET 2.0. It will allow you to start taking advantage of the new tooling features, without having to immediately upgrade the clients and servers running your application’s to .NET 4.0. The improved multi-targeting support will ensure that this experience is even better and more accurate than before. Generally, it is not recommended to store passwords in the binding file and by default BizTalk administration UI clears it out when exporting binding to the xml file. But in development environment where you have automatedcontinuous integration build and deploymentnot having password in the binding file will prevent application from starting and CI process fail. It can become tedious in staging deployments (TEST, UAT) as well, especially if you have multipleendpoints that use accounts with passwords. In such cases, having password for development account (hopefully not the same as production)in binding file can make life easier. Save and use this binding for an automated deployment script. Today’s post is about another small, but I think nice, change coming with VS 2010 and ASP.NET 4 when you create new ASP.NET Web projects – which is the ability to create both “Empty projects” as well as to create projects that already have some layout and common functionality included in them, and which can help you get started when building a new application. 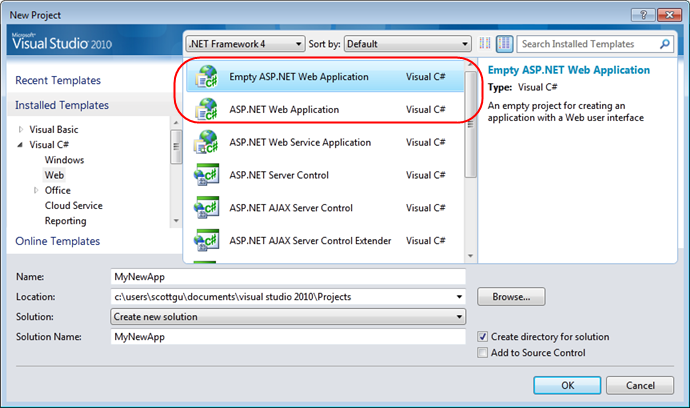 VS 2010 ships with “empty” project templates for creating new ASP.NET applications – which will create minimal projects with just the bare essentials needed to get going. My last post in this series included a screenshot that shows what the “Empty ASP.NET Web Application” project template creates when you use it to start a new application. 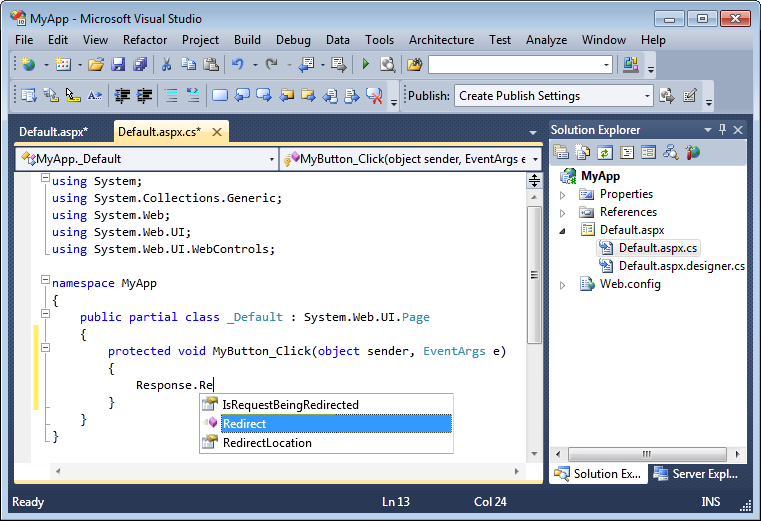 VS 2010 also ships with starter template projects that allow you to create a new ASP.NET application that has some layout/CSS structure and common functionality already implemented within it. 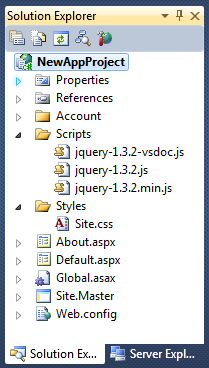 All of the styles and content within the site are configured using CSS, and take advantage of some of the new features with Web Forms in ASP.NET 4 – including clean client-side “id” names (no more ctrl_ mangled names – ASP.NET 4 gives you complete control over the client id), and CSS based rendering instead of table based rendering for the built-in server controls. I’ll discuss these new Web Forms features in a lot more depth in later posts in this series (along with a lot of other features being added). This will hopefully facilitate the creation of lots of useful project starter kits (of all types of projects – not just web) that people can easily discover and use to quickly get going when building solutions.